The life cycle of a moth or butterfly is a famous one: eggs hatch, releasing caterpillars, which pupate to become adult moths or butteflies. The caterpillar stage in particular offers subtle lessons about the ecology and diversity of the estimated 20,000 living moth and butterfly species. Few generalizations can be made regarding the life span of such a large group; some species live mere days, and others live for more than a decade. Moths and butterflies -- collectively referred to as lepidopterans -- demonstrate a life cycle called complete metamorphosis. Butterflies and moths lay large numbers of small eggs on vegetation. These eggs hatch into larvae, colloquially called caterpillars or silkworms. 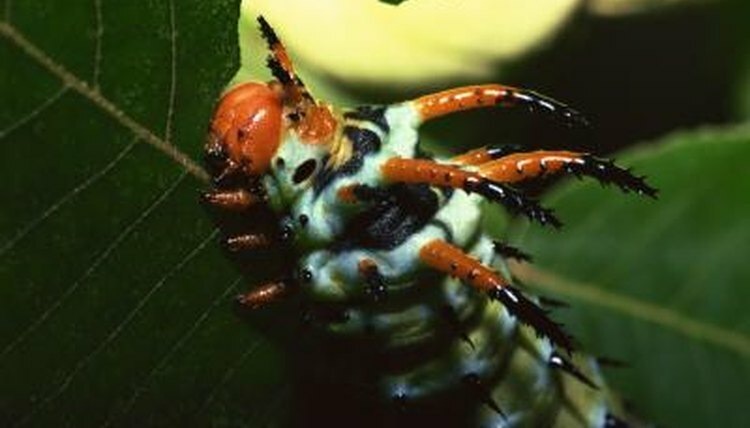 The larvae eat, grow and eventually pupate, during which time they are relatively immobile. An adult moth or butterfly will emerge from the pupa, mate and complete the cycle. The adult moth or butterfly is the most obvious and conspicuous stage in the animal’s life cycle -- if one of the shortest. Most adult moths and butterflies live a matter of days or weeks, and some don't even have feeding mouth parts. Despite this, some species have extended life spans. Monarch butterflies (Danaus plexippus) travel great distances and live up to seven months; morning cloaks (Nymphalis antiopa) overwinter as adults and live at least four months or more; and Gonepteryx rhamni are known to live almost a year. Most butterfly and moth larvae complete metamorphosis in a few months; a few, like the painted lady (Vanessa cardui) complete the transition in as little as four weeks. Some species exhibit extraordinarily long larval stages; for example, the fox moth (Macrothylacia rubi) can remain a caterpillar for five years. The woolly bear (Gynaephora groenlandica ) is the longevity champion, remaining a caterpillar for up to 14 years. Because of their arctic habitat, these woolly caterpillars spend most of their lives frozen. Each year, the larvae awaken to feed for about a month and then go back into suspended animation. The pupal stage affords protection while the animal undergoes its second transformation. This stage takes several different forms in lepidopterans; while many are only protected by a thin layer of dead cells, some species spin silken cocoons to protect themselves. While most pupa last weeks or a few months, some lepidopterans -- among them the hickory horned devil (Citheronia regalis) -- remain in their pupal state for a long period of time. These very large caterpillars normally pupate for 11 months, but some individuals hold off final metamorphosis for up to two years. As a broad principle, the geographic latitude of a given moth or butterfly determines the length of the creature's life. Butterflies nearest the earth’s poles have short growing and feeding seasons, and it takes many of them more than one year to complete their life cycle. Moving toward the equator, butterflies and moths obtain their resources more quickly. This speeds the lepidopterans life cycles and reproductive frequency. Most temperate zone species produce one or two generations per year. In the tropics, where food and warmth are plentiful year-round, butterflies and moths may produce several generations per year, thanks to their accelerated life cycles.